ARKPS4Servers.com is a site dedicated to helping server owners find more players and build their communities. We're also dedicated to helping ARK players find the best servers that have the best settings and rules for them. My name is Jay Cartere and I built this site for you. You may have seen some of my ARK videos on YouTube. If you have then you may know that I played on the ARK official PVP servers for about 3 months before deciding that it wasn't worth my time anymore. On the official servers I created a tribe that eventually became Alpha of the server we played on. I also met a lot of cool people and a bunch of toxic dicks. The truth is, I didn't have the time or the desire to play on official servers. They are far too grindy for me and there are more toxic players than you can shake a wooden club at. When the Nitrado rentable servers finally launched, I jumped back into ARK excited and ready to play on my own server on my own terms. Since then I have had the most fun that I've had playing ARK and I would NEVER go back to official. The thing is... there are SO many server owners out there who just don't know how to market and get more players on their server. So many people who want to build great communities, but don't know where to start. That's where ARKPS4Servers.com comes in. I've been able to get over 1376 players to register to join my servers since I launched them. This was mainly due to my knowledge of marketing and leveraging my YouTube channel. I am now using that knowledge to help you do the same. You can list your servers for absolutely free and there are paid packages if you want to build your community faster and help out the site. Most of the money made through this site will go to improving the site, paying off the costs of making the site in the first place and advertising/marketing - this means more players for your servers, so it's a win-win! I've also created a bunch of downloadable game ini code PDFs to help you get your server up and running the way you want ASAP. The site also fully supports your ability to create a group page for your server community or for your tribes. 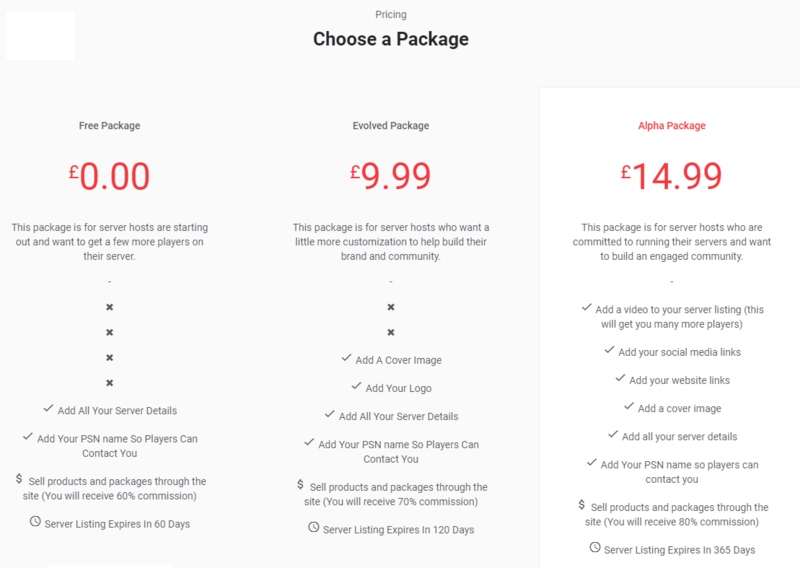 Server owners can also sell packages to their players through the site. Every user also has their own profile page and you can add others as friends etc. Be sure to explore and check out all the possibilities! This is your one-stop shop for all things ARK... on the PS4 (I may expand to other consoles in the future if there is enough demand and support). Grind less and have more fun!